Radically simple with its plot and emotionally exhausting with its tee-tottering tone, Foxtrot is a film which I don’t think I would advise others to revisit or even force myself to endure multiple times; the mood is so evocative, so precarious, so hopefully nihilistic that the first great impression does enough to resonate thoroughly and wholly. Pleasant and piercing and painful, Foxtrot uses a bevy of gallows humor and explores the many forms of cinematic expression to contextualize and accentuate what it means to live in a constant, unnerving state of war and internal terror. It’s an unforgettable experience. Like any quality narrative – and, quite justifiably, representative of every single life – Foxtrot has the look of a three-pane window, which when cleaned and shined, reveals itself to be a lens for us to peak through at a universal story of grief. For Michael (Lior Ashkenazi) and Dafna Feldman (Sarah Adler), a knock at the door brings irrevocable consequences. Dafna flat-out faints. Michael lapses into a tweaking fit of anxiety. These were soldiers who begrudgingly and routinely greeted the unhappy couple at their swanky apartment door, and the film does wonders by conveying through performance what would normally be relegated to passing dialogue. Something bad has happened. A page has been ripped from its binding. As fraught as it is intense, the opening act dissolves into a perplexing middle. Jonathan Feldman (Yonaton Shiray) and three fellow soldiers watch a security post on a desolate, dimly lit Israeli road. They trudge through mud, live on canned meat, and dwell in a shipping container (it’s literally sinking and the camera angles show the off-kilter nature of this militaristic lifestyle). Most viscerally represented in this quartered off and limping limb of a segment is the gradual onset of anxieties born into the human psyche from wars of attrition. Nothing really happens. Time after time we expect disaster and are almost disappointed by the lack of action given the incredible intensity of the moment. Quite beautifully and altogether achingly, Foxtrot depicts the mundane horrors of modern global warfare. It’s boring only until it’s searing, and the film provides an intimate sketch of what it means to live in a constant, inescapable state of fear, as well as one that’s altogether too quickly succumbs to the fleeting fame of the inevitable next atrocity. 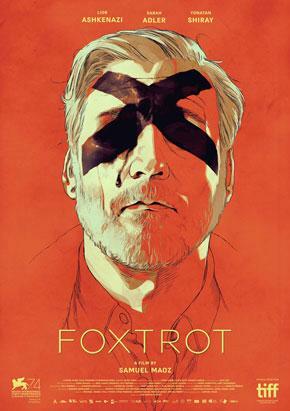 Foxtrot is almost entirely filmed in intimate close-ups interspersed with three key variations: the occasional extreme close-ups (to show unease), a few powerful master shots (to develop tension), and some excellent use of high-angle perspectives (to show static movement and internal confusion in moments of disarray). These are classic yet clashing filmmaking techniques, well polished and elegantly utilized by writer/director Samuel Maoz, and the framing makes the picture almost unbearable in its aversion to distance. Foxtrot purposefully wants to be in your face, wants to confront your emotions, and allows its remarkable actors to contort their cheeks and brows and eyes in ways that allow us viewers to register their emotions on a Richter scale. By packing a wealth of eternal meaning into its well-intentioned title, Foxtrot literally dances us along to the tune of culturally embedded warfare and shocks us out of the rhythm of tyranny with unexpected explosions. Don’t watch the trailer. You’re best to go in blind; it’s how the film wakes you up and makes you see.